NEXT Place onions inside a 12-inch cast iron skillet or glass baking dish (coat with cooking spray is using glass). Lay chicken on top of onions, breast side up, tucking wing tips. Combine mustard, vinegar, oil, honey, salt, pepper and pour over top of chicken. LAST Place skillet on middle rack of oven and roast for 15 minutes. While chicken is roasting, toss peaches with vinegar and rosemary. 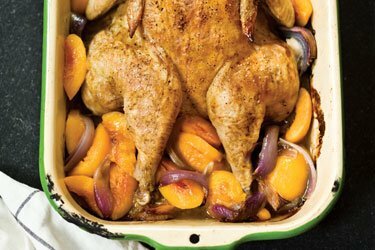 Reduce oven temperature to 400°F and arrange peaches around chicken, stirring into the onions. Continue cooking for an additional 15 to 20 minutes or until a meat thermometer registers 165° in thickest part of breast. Let meat rest for 15 minutes before cutting.